Details: A fine and striking portrait thought to be Mrs Judith Gregge-Hopwood. It has been attributed to an artist close to Joesph Wright of Derby and is in very fine condition. Although the subject’s identity is not certain, a 19th century repository label on the back of the original frame lists’ the name Hopwood. They were an ancient and influential Lancashire family with their family seat at Hopwood Hall, Middleton, Lancaster. They could well afford a portrait by a noted artist. The earliest listed Hopwood was Alain de Hopwood in 1380. The direct line became extinct with the death of a Dr. Hopwood in 1820, but the Hall passed eventually to his cousin Edward Gregge (c1740-c1790) who assumed, by Act of Parliament in 1773, the name Gregge-Hopwood. In 1773 Edward married Judith Sunderland (c1740-c1800) daughter of John Sunderland of Whittington Hall, Lancashire - only some 30 miles from Hopwood Hall. Their son, Robert, was born 30 November 1773 and became High Sheriff of Lancashire in 1802. He married the Hon Cecelia Byng, daughter of Viscount Torrington. 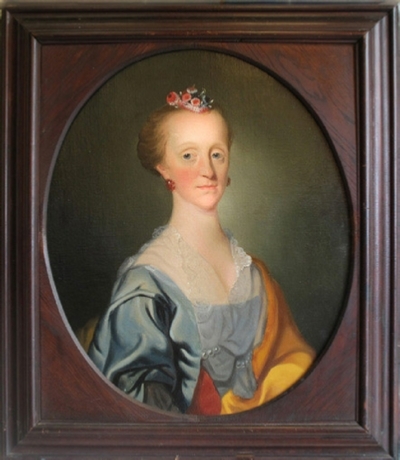 The portrait dates from c1775-1785 and depicts a lady in her 30/40s and the most likely identification is therefore Mrs Judith Gregge-Hopwood (nee Sunderland). Joseph Wright of Derby was one of the most important provincial portrait painters of the 18th century. He trained under Thomas Hudson in London but instead of practicing there set up in the provinces, mostly in Derby, but for a short while in Liverpool (1768-71) where he taught and influenced many good artists in that area. This striking and fine portrait clearly by a good hand has many of Wright’s characteristics but without clear provenance and no mention in Wright’s list of sitters, cannot be attributed to him. It has, however, been attributed by Messrs Christie’s to his circle. From its style it can be dated to circa 1775-85 and because the subject is thought to be from a Lancashire family it may well be by one of Wright’s pupils from the Liverpool area, only some 40 miles from her Seat.